This article was originally published on Venture Beat. There’s an open secret that everybody knows, but nobody can really talk about. And more likely than not, it’s affecting your career growth. Most employees are used to company social media policies, which set guidelines for employees looking to post on social media, write blog posts, or otherwise communicate with the public – whether or not the communication is related to the company. We normally accept these policies as just another part of corporate life, assuming that every other professional follows suit. But in the past five years, I’ve increasingly heard from dozens of professionals, at companies of all sizes, that these social media policies may have unintended effects. First there’s the man who couldn’t comment about a professional topic because his “highly exclusive” software company required him to go through media training first – even though the topic was completely unrelated to his company or his company’s industry. Then there was a professional who told me he wanted to speak on a panel, but chose not to because getting HR approval was such a politically-charged, cumbersome process. And then there was a woman who impressed me so much, I wanted to nominate her for an industry “40 under 40” award. She told me that although she was honored, she’d rather not be nominated unless I coordinated with her company’s PR team. If she bypassed the process, she told me, she could be “ostracized” for the external publicity. Then there was the woman who actually did receive a prestigious industry award, and immediately regretted it. “I nearly had to apologize for the award after I received it,” she confided in me. And it isn’t just within my own circle. Social media shows several professionals frustrated by these effective gag orders. Companies do have legitimate reasons for implementing social media policies. The policies help maintain confidentiality, control external messaging, protect intellectual property, and track branding. So where are they going wrong? The issue isn’t the policies themselves. Rather, it’s the way these policies are enforced in practice, and the implicit messaging that accompanies them. In many cases I’ve seen, the issue isn’t that employees are completely barred from receiving awards, publishing, or speaking at events, it’s that employees are forced to jump through so many hoops to do so. The process can get so cumbersome that it doesn’t seem worth it. If your employer won’t even let you comment on LinkedIn, why would you feel free to speak at panels or conferences? Or the process can end up politicized. If you have to tell your manager every time you get recognition outside the company, you may be seen as constantly trying to “one-up” them. 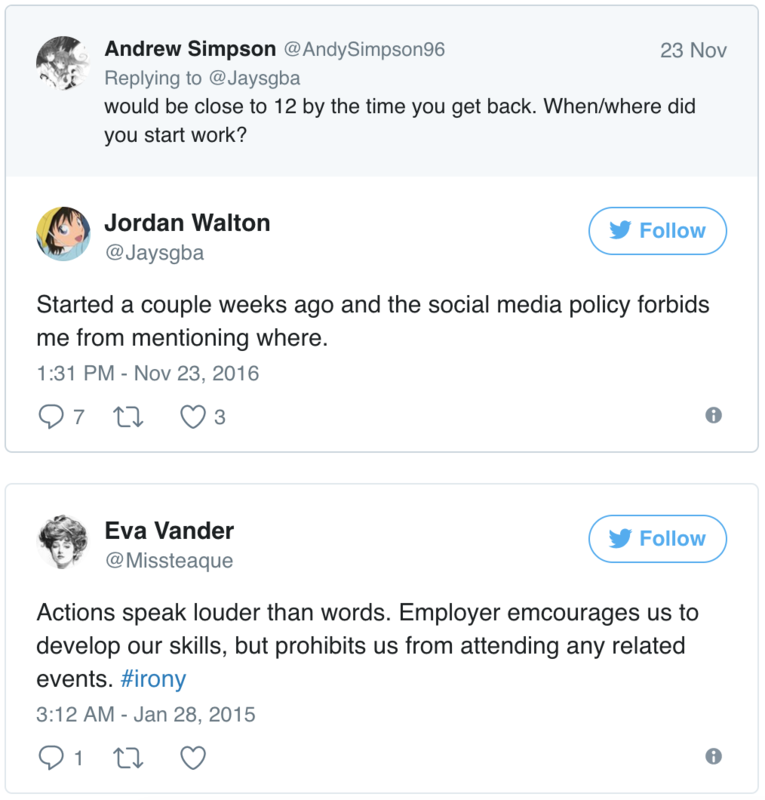 It’s easy to dismiss this as a simple issue – if you don’t like a company’s social media policy, don’t work there. But it’s not that simple. First, the widespread issue is with the enforcement practices, not the policies. It’s nearly impossible to perceive how a company’s social media policy will be enforced by reading the language alone. After all, the nature of the problem is that nobody can really talk about it! Second, we are switching jobs today more frequently than ever as new technology and trends quickly change and skills become obsolete. So maintaining a portable professional reputation is becoming increasingly important. Developing this reputation by engaging in social media, publishing, or even speaking at events gives employees the opportunity to learn new skills, keep up with technology, pursue their passions, showcase their expertise, influence the industry, and much more. In fact, the number one topic that other professionals ask me about is how to gain more visibility. And nine times out of 10, they tell me I’m lucky to work for a startup, where I have more freedom of speech! And that brings me to the third problem with this practice: It’s probably illegal. Restrictive enforcement of social media policies can often chill free speech. How much progress would Susan Fowler have made if she’d had to ask Uber’s permission before writing that iconic blog post? The National Labor Relations Board has declared that workers have a right to discuss work-related matters on social media. In fact, the labor board’s rulings tell companies that broad – either as written or as enforced – social media policies are illegal when they “would reasonably tend to chill employees” from communicating with each other about work conditions. These restrictive practices hurt not only employees and companies, but entire industries that miss out on important diversity of thought. So the secret’s out. These benign social media policies, through restrictive or negatively ambiguous enforcement practices, are frustrating professionals and stunting career growth. What can we, as an industry, do? It’s time employees realize that their personal growth is far more important than adhering to the culture of fear cultivated by these practices. As the NLRB ruling shows, it is every employee’s right to engage in free speech, political activity, and improving work conditions. When your lawful, appropriate conduct is questioned, view it as an opportunity to politely educate your company’s “enforcers.” This will help them realize they have no reason (or right) to restrict harmless free speech. This especially applies to those in higher-ranked positions who have more power. It’s on you to help change the status quo for those who may not have as much clout. It wouldn’t hurt employers to get on board as well. 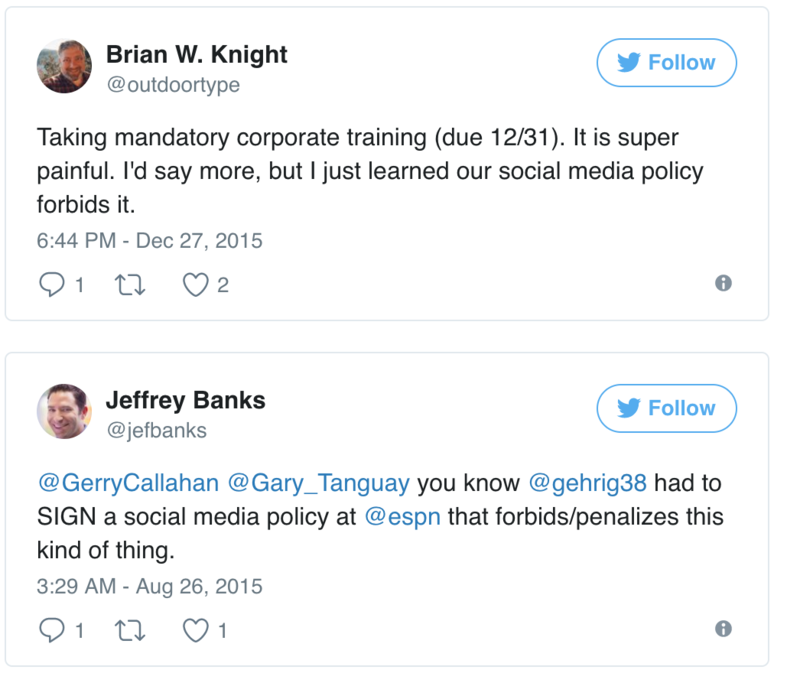 Companies don’t need to do away with social media policies altogether. They just need to shift their enforcement practices. Employers should aim to coach their employees on effective, positive social media, publishing, or speaking – not strictly prescribe or enforce when, what, and how they can do. 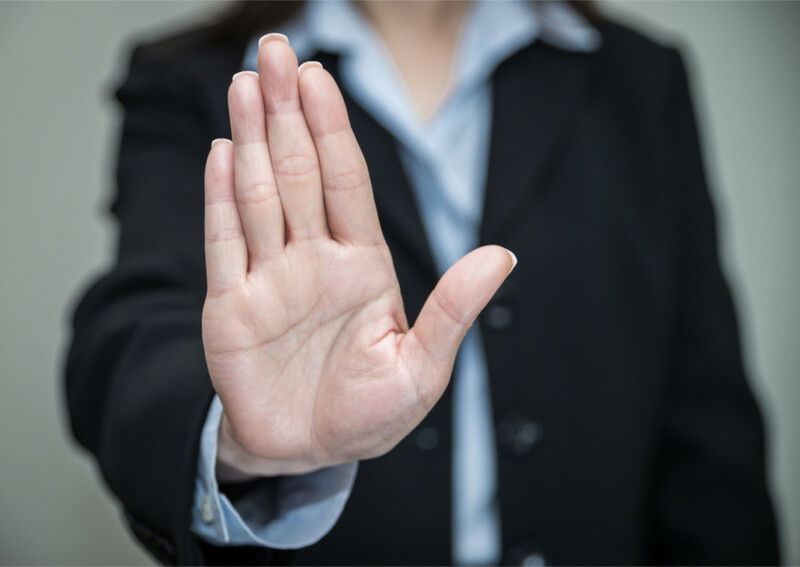 Otherwise, these restrictive practices will eventually come back to haunt employers. Employees are their companies’ biggest evangelists, especially in the age of social media. High profile employees – those who speak at events, write articles, do interviews, serve on boards, and maintain social media – actually benefit companies. When professionals develop portable professional reputations, their companies shine, too. For example, Sheryl Sandberg’s Lean In and Plan B movements have reflected positively on Facebook and Mark Zuckerberg. And Tracy Chou, who forced companies to release their diversity data, definitely reflected positively on Pinterest. Think about it this way: You’ve already invested time and resources into hiring these professionals. You should trust their judgement and encourage them to grow. Even if that growth takes place outside the company, all the positive publicity and goodwill will flow back to you. Board service, speaking gigs, articles, interviews, social media, and freelance work are all valuable parts of a well-rounded professional’s career. So enough is enough – employers, stay in your lane!